Access control has become increasingly important for organizations of all shapes and sizes. Whether you are managing thousands of people on a college campus or a dozen employees in a local office, you must ensure their safety while on your property. Access control security (identity and visitor management) is a constant balancing act between convenience and security. If you have been asked to find and deploy an access control solution for your organization, you probably have a number of questions. How can you ensure safety while also supporting convenience? 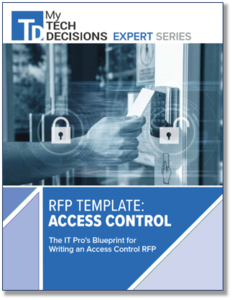 Our editors have worked with technology integrators and IT pros just like you to develop our new guide “RFP Template: Access Control”. It provides an overview of the major considerations and technology options as well as specific questions that you should include when writing an RFP. Get your copy today.